When you go to bear country, you want to be armed. You also want to know that the firearm you select will successfully stop the threat of a charging bear. There’s no question that you want the best bear-defense gun out there, whether it’s a pistol, a rifle, or a shotgun. We’ve done the research and picked the 3 best bear-defense guns. Some people might prefer an easy-to-carry side arm, while others might only trust a 12-gauge shotgun. In any case, we’ve selected the best bear-defense gun in each category: pistols, rifles, and shotguns. Remember that the ideal bear-defense gun can accurately shoot out to at least 50 yards, can fire a fast repeat shot, can carry loads that have adequate stopping power, and is extremely reliable. Two U.S. Forest Service employees, William Meehan and John Thilenius, tested a variety of rifles, handguns, and 12-gauge shotguns at the point-blank range of 15 yards in 1983 and found that only the .44 magnum pistol, rifles with a larger caliber, and a 12-gauge shotgun with slugs were powerful enough to stop a bear. Magnum pistols have one advantage over rifles and shotguns: the ease of carrying them. If you need the ability to use both hands, a pistol is great, as it can be carried in a holster. But even with a high caliber bullet, a handgun does not have the stopping power of a rifle or a shotgun. Thus, a pistol may be a good backup bear defense gun, but it likely shouldn’t be your primary weapon. Remember, though, that you will need to be very accurate if you are using a pistol as your bear-defense gun. You’ll want to aim for the brain and be able to hit it even under stress. If you aren’t extremely comfortable with handling pistols or if you haven’t practiced much with your bear-defense pistol, a rifle will likely be a better choice for you. Even so, you can find a variety of different opinions on the internet about the success of pistols in defending against a bear attack. A recent article from Ammoland researched 37 cases of people using pistols to defend themselves against bears and found a 97% success rate with a pistol. Why It’s Cool: It’s powerful enough to stop an attacking bear but it’s also small enough to carry around all day. 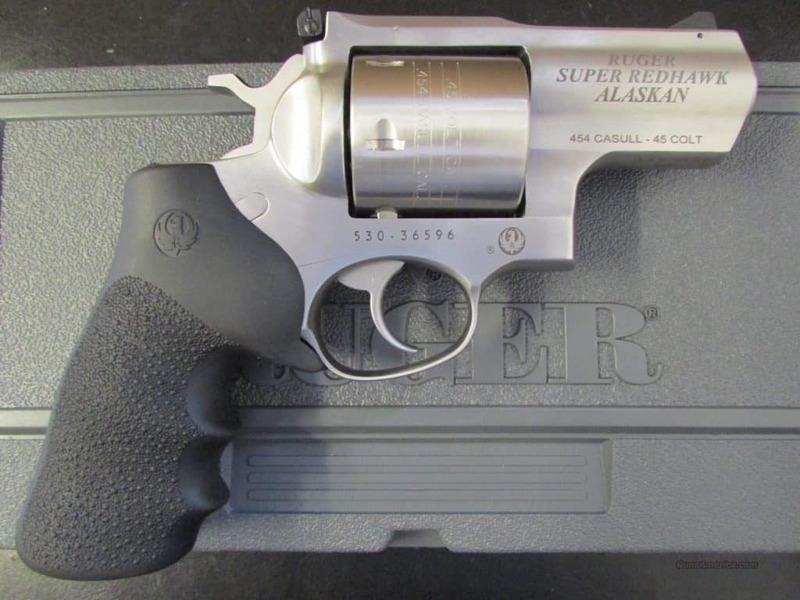 The Ruger Super Redhawk Alaskan was designed with bears in mind. Created to give individuals a reliable sidearm that was easy to carry all day in a hip holster, the Redhawk Alaskan provides great bear protection while backpacking, camping, or fishing. As a side benefit, it can also function as a backup gun to have when you’re hunting with a larger rifle or shotgun. If you shoot this baby, it’s going to have a big kick, but Ruger has made it more manageable with a triple-locking cylinder at the front, rear, and bottom of the frame. You’ll need to make sure that you practice to deal with the increased recoil, as you fire additional rounds. At the same time, if you have weak grip strength, you should be careful about firing this weapon. A rifle or shotgun is probably going to be a better option. Some who are recoil sensitive were quite impressed that even with full power loads, the Super Redhawk Alaskan .44 Mag wasn’t too abusive. The Hogue grip helps to manage the recoil well. The reason why many people like the .44 Magnum is because it’s a tough bullet that will penetrate deep into the bear, and the ammo can be found almost anywhere in the United States. Some people really want the “mega-magnum” .454 Casuall, but for many users, the .44 Magnum has plenty enough power. Introduced in 2005, the Super Redhawk Alaskan has greater flexibility with a shorter barrel, as it can be easily and quickly drawn from a chest holster. To those who question the ability of a pistol to stop an incoming threat, another version of the Super Redhawk Alaskan in .454 Casull/.45Colt successfully stopped the threat of a predatory bear. One individual noted how the .454 Casull version was the preferred handgun for most Alaskans. Designed as an extremely compact backpacking weapon, the Redhawk Alaskan excels at this role. You’re only adding 2.5 pounds, and you have six changes to take out a large animal. It has a pretty high price tag, but when your safety is on the line, I think you’d say it’s worth it. If you opt for a rifle, it needs to be a medium or big bore rifle (.33+ caliber). .30-06 and .300 Magnum rifles that fire ammunition with 180-220 grain bullets are also great choices. Many people prefer powerful rifles to protect against bears. A side-benefit for some rifles is that they can double as a defense and a hunting rifle. One thing to keep in mind is that you don’t need fancy or exotic ammo. Remember that where you’re often going to encounter bears is in Alaska and Canada, and they don’t have fancy ammo. In fact, a survey found that professional Alaskan brown bear and grizzly bear guides consider the .338 Winchester Magnum cartridge and the .300 Winchester Magnum cartridge are the first and second most popular choices respectively for defense against bears. When selecting a rifle for bear-defense, be sure to select a double-barreled or repeating rifle. You’ll often see a range of .30/180 grain all the way up to .45/500 grain. You may even prefer a bullet with a high SD if you expect the bear to be aggressive. A lever-action carbine is often a preferred bear-defense rifle, as it has a shorter barrel but still packs a powerful punch against a bear. Why It’s Cool: The Marlin Model 1895 Guide Gun is the definitive bear defense rifle since the early 1900s. It’s an Alaskan and Canadian favorite in bear country. If you’re looking for a great bear-defense gun, none can compare with the classic Marlin Model 1895 Guide Gun. As the name implies, many hunting guides in Canada and Alaska (and other areas in North America) swear by it. It doesn’t have a long-range, so it isn’t a great hunting gun. But it doesn’t need to be. Countless guides and individuals traveling in bear country have relied on this rifle for bear defense, and it’s come through, stopping charging bears within a 100-yard range. The Marlin 1895 may be the best gun choice for close range. Chambered in the traditional .45-70 Government cartridges or .450 Marlin cartridges, the Marlin 1895 is a lever-action gun with an 18- or 22-inch barrel. If you think it’s likely you’ll be in tight spots, the shorter barrel is truly ideal. Also, at a weight of about eight pounds, the Marlin 1895 is easy to carry and handy, but also accurate and powerful. You can also use it for shooting deer, hogs, and moose (if you happen to encounter one of those) in close cover. At a very short range—50 yards, for example—it is scarily accurate. You will have one ragged hole, which is exactly what you want with a charging bear. Even at 100 yards, you’ll likely get 2” groupings. Unlike a pistol, a shotgun (like a rifle) is going to be a little bit harder to carry around all day. But nothing can compare with the stopping power of a 12-gauge shotgun. At close range, 00 or 000 buckshot as well as slugs will do well in taking out the bear threat. If you’re dealing with a quickly attacking bear, nothing is going to provide better defense than a 12-gauge shotgun. In addition, if you don’t do well under stress or perhaps you’re not as comfortable handling firearms, a shotgun is fast and forgiving if you’re dealing with a moving bear. As a side benefit, a 12-gauge shotgun is also great as a home-defense weapon and as a firearm for hunting. Supposing you decide to go for a shotgun, you load it with the standard Alaska bear medicine: alternate between three buckshot and three slug loads. It will definitely deter a bear. Only problem is that it is extremely bulky, and you may decide you don’t want to carry a gun at all. And that’s a problem! Why It’s Cool: The Mossberg 500 is a definitive shotgun for bear defense, and it is an excellent all-purpose gun. You can’t go wrong with 12-gauge shotgun in stopping a bear. An official 1990 United States government report noted, “12-gauge shotguns are effective on large animals at distances up to about 40 meters [roughly 44 yards].” The report also mentioned that buckshot is only effective at too close a safe distance for defending against bears. The two models of choice tend to be the Remington 870 or the Mossberg 500. In addition, you can use your 500 or 870 for hunting (bird, deer, and hog), home defense (especially if you want the pump action sound), and just-for-fun shooting. Although we like the 500 better because it’s a bit more affordable, one author notes that the Remington 870 is “the most carried weapon for bear defense in Alaska.” But no matter whether it’s a 500 or an 870, people want a tactical version shotgun that has a short barrel and an extended magazine. Although it’s a huge debate as to which is the better gun, you can’t beat a 500 for the money. Plus, if you’re a female out in bear country, the 500 is a little bit lighter than the 870. Finally, many people swear that the 500 is an extremely reliable shotgun, which is exactly what you need when you might encounter bears. The 500 is very easy to shoot and is quite accurate. Beware of the recoil, though. If you’re a female, you need to make sure you’re ready for it, especially when you’ll likely be dealing with a very angry bear. Make sure that you don’t use the shotgun for the first time when trying to take out a bear. At the same time, you’re not going to need as much practice with a shotgun to shoot accurately. Thus, a 500 will give you all the protection you need, and just the sound of it make frighten bears away. In sum, the Mossberg 500 is a dependable shotgun. The Remington 870 is also an extremely popular option, but the Mossberg 500 wins out in our book because it’s a little bit cheaper. If you’re looking for a shotgun that is slightly easier to handle, consider trying the 500 (or 870) in a short barrel (24 inches). It will be less bulky, but not any less powerful. There’s no need to worry when you go to bear country if you have one of the 3 best bear-defense guns. Pick a firearm that is going to make you the most comfortable. If it’s an Alaskan pistol, awesome. If it’s a powerful 12-gauge shotgun, great. And if it’s the classic 1895 guide gun, you can’t go wrong. Whatever the case may be, make sure that you have a reliable firearm choice because you’re probably not going to be as good as the Eskimo woman who killed a bear with a .22 rimfire pocket pistol. Hopefully you now have a better idea of what bear-defense gun is going to be best for you! If you enjoyed this article, please share it with a friend.